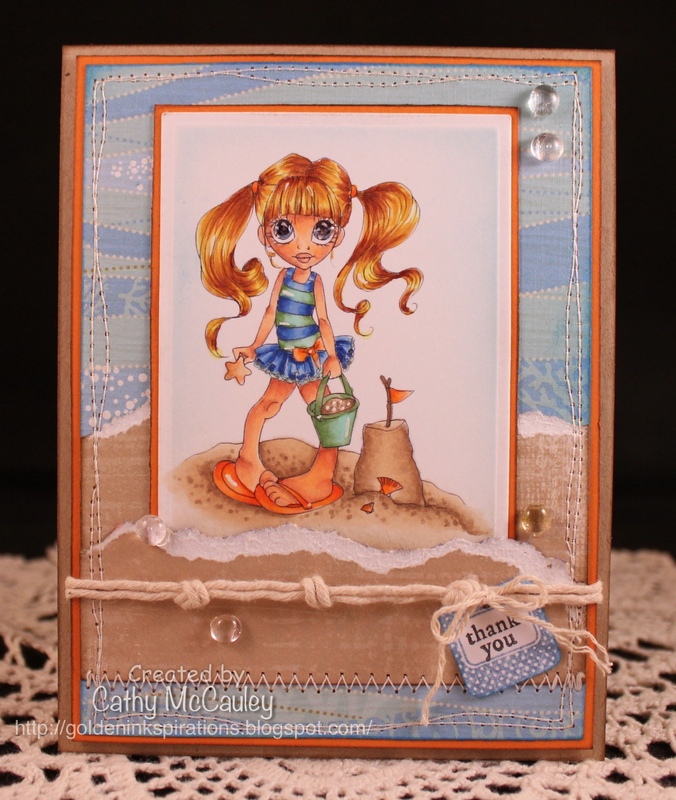 I was so surprised and honored to be asked to be a guest designer for Can You Digi It! The new challenge posted on their blog today is "Bird is the Word." I have never used digital papers before, but had a wonderful time playing with these digi papers and bird images from the Can You Digi It! store. Creative Nugget: The digital papers came in a pack called "Bird is the Word" by Green Goddess Creations and includes six textured papers and six patterned papers...quite a bargain! The little Birdie image by KiniArt, was printed out on Neenah Solar White card stock, colored with copic markers, and cut with an oval nestie. All of the banners on the card are made from papers in the pack, and the ends cut with a Photo Corner Punch. 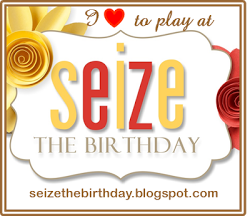 The sentiment is computer generated with the phrase being completed on the inside of the card...it's your birthday! Some stitching and rhinestone stickers complete the card. Head on over to the Can You Digi It Blog for details on how you can play along in the challenge, and check out the Can You Digi It! Store for wonderful digi supplies! Thanks for flying by...have a wonderful day! Hello stampin' friends! Hope you had a wonderful weekend and are ready to begin a new week. I had a chance to relax at the beach last week with my family. The weather was perfect the whole time we were there and we had a fabulous time....we ate entirely too much! The only glitch was my SIL's car broke down and had to be towed all the way back home. We managed to pile everyone, including Kody, and ALL the luggage into my car for the trip home...what an experience! 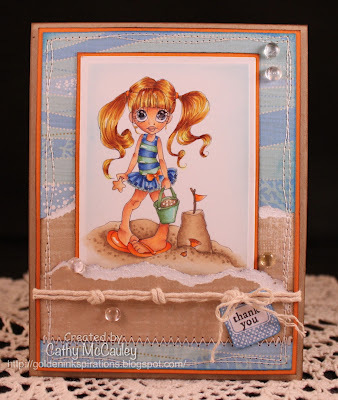 This week promises to be just as busy with VBS and the new August release by Sweet 'n Sassy Stamps. 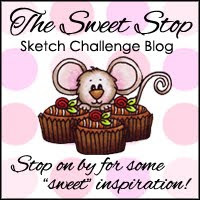 So, that being said...I apologize for this late post, but I do have a sample for The Sweet Stop sketch this week. Creative Nugget: In my copic class, I'm learning how to color trees, so this adorable Tiddly Inks image was perfect. I'm not sure I have the shading quite right yet, so you'll probably see this tree image popping up again down the road! I did manage to create a little texture on the tree by dabbing on some colorless blender ink. Sweet Treat Wryn was also colored with copics, fussy cut out, and popped up in front of the tree. A dab of Glossy Accents was added to the ice cream. The colored image was layered on True Black card stock and patterned paper from the Alora Collection by Bo Bunny. All panels were attached to a Select White card front. The corner of the main panel was curled and some flowers from the DP were cut out and added. 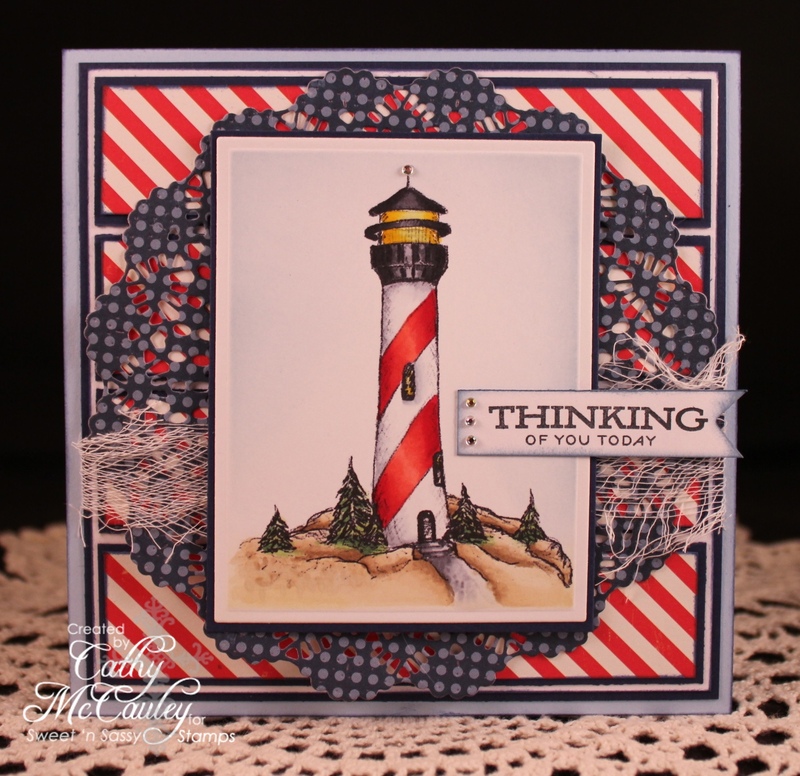 The sentiment is from the Summertime Rhubarb set by Sweet 'n Sassy Stamps and was stamped on a hand cut flag. A few colored pearls and some Baker's twine finish the card. I hope you'll take some time to visit the other Sugar Babies and play along with us at The Sweet Stop! 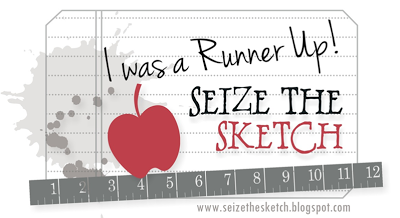 This sketch is perfect for those large images or for creating a scene! In either case...I can't wait to see your fabulous creations! Thanks so much for stopping by! I hope you'll have a chance to join the Sweet 'n Sassy Divas for the new August Release Blog Hop on Thursday....can't believe it's August already! Hello everyone and a happy Saturday to you! I hope you all had a wonderful week in spite of the heat and the rain! Thursday was busy as Sweet 'n Sassy Stamps began their Christmas in July Hop! You still have one more day to join the fun and enter the hop for a chance to win a free Christmas stamp set of your choice. Just scroll down to my last post to see all the details. This week's sketch with a spin at The Sweet Stop means there's another chance for a Prize...$15 to spend at the Sweet 'n Sassy Store! The spin this week is to use numbers. My sample features a brand new character at the Sweet 'n Sassy Store...meet Kiwi Koala, a new digital stamp called Kiwi Koala's Watermelon! I think we may see more of Kiwi in the future! This little Saturated Canary Beach Baby was a lot of fun to color. Isn't she adorable? Thanks so much for stopping by! 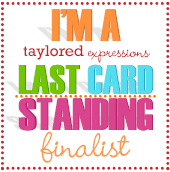 I hope to see your SSS168 cards with a spin in the gallery at The Sweet Stop! Have a wonderful weekend! 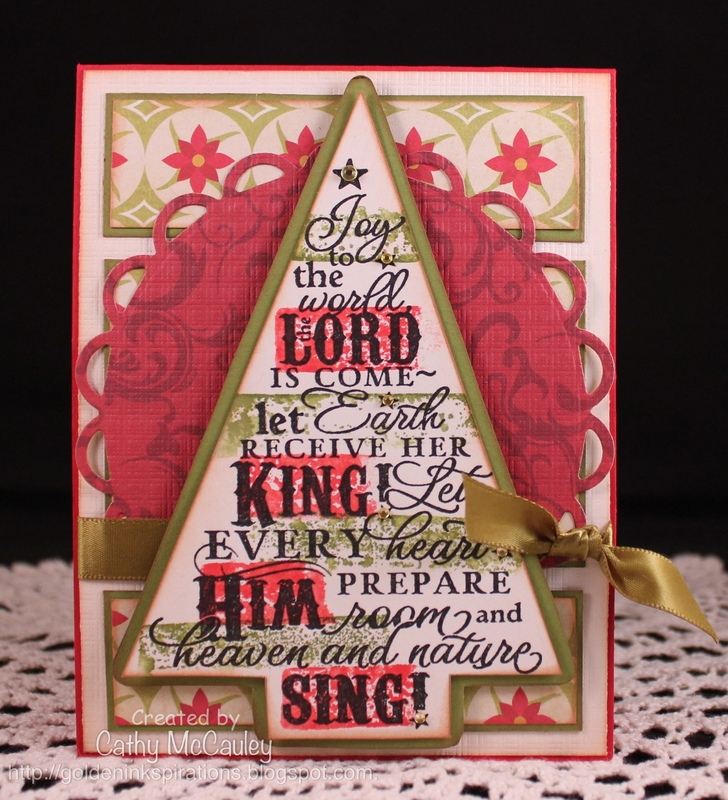 Sweet 'n Sassy Stamps is celebrating Christmas in July! 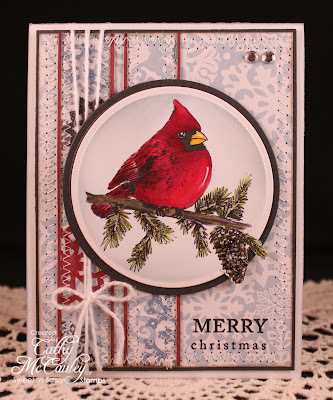 What a perfect opportunity to get an early start on those Christmas cards and Sweet 'n Sassy Stamps has some of the most wonderful images for the job! Ready to see what the Design Divas and a few special friends have been up to with their Christmas stamps? Take a look! If you've come from Monika's Blog, you've already seen some fabulous stamp sets in action. 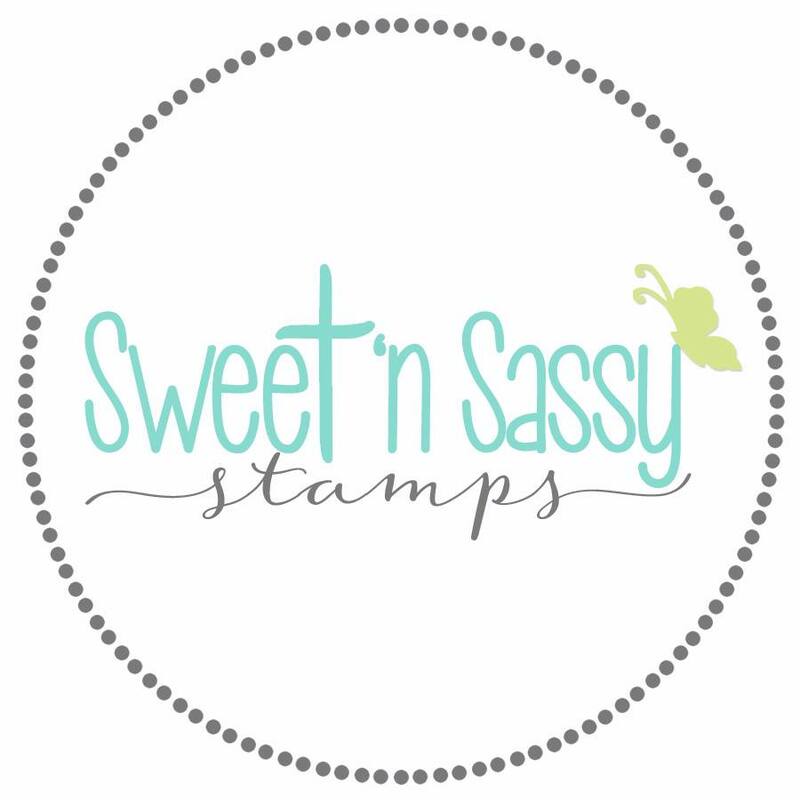 If you just happened to stop by, be sure to begin at the Sweet 'n Sassy Stamps Blog to read about how you can join in on this hop and win some prizes! Creative Nugget: For my sample, I used the clear stamp set, Season of Love. To begin, the silhouette image was stamped on Vintage Cream card stock and cut out with a square nestie. The beams of light coming from the star were masked and sponged with Wild Honey Distress ink. The rhinestones were colored with a copic marker and added to each star. The patterned paper is from Graphic 45 and was layered onto True Black card stock. All of the panels were layered onto a Vintage Cream card front. A Spellbinders fancy label die was added to the bottom panel. Some lace and ribbon were sponged with Antique Linen Distress Ink to age them. Black rhinestones complete the card. Lots of great things are happening at Sweet 'n Sassy Stamps during these pre-holiday festivities! ALL Christmas clear stamps are 20% off through Wednesday, July 25. Three new holiday sets are available in the store right now! You can get them before they are released in September and October...AND if you buy them now, you can take advantage of the sale price! Every order of $25 in Christmas clear stamps will receive Gingerbread Man, a darling new 2" x 2" mini clear set. And as always, all clear stamp orders of $50 or more get this month's free w/ stamp set, Christmas Candle (while supplies last). 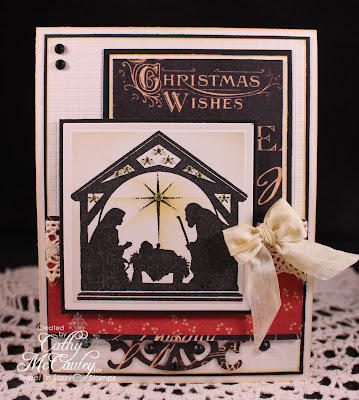 Now head on over to see Mary Faus for more Christmas sweetness! Here is a list of the bloggers participating in the hop in case you get lost along the way! And what's the best part about Christmas in July? We want YOU to play along with us! Use Sweet 'n Sassy Stamps to create a Christmas project and link it below to join in our Customer blog hop. You have until Sunday, July 22 at 11:59 PM EST to play along. One randomly selected participant will receive their choice of one Christmas clear stamp set! Thanks so much for hopping with us today. 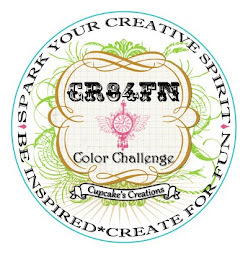 I can't wait to see your Christmas creations! Good morning stamping friends! 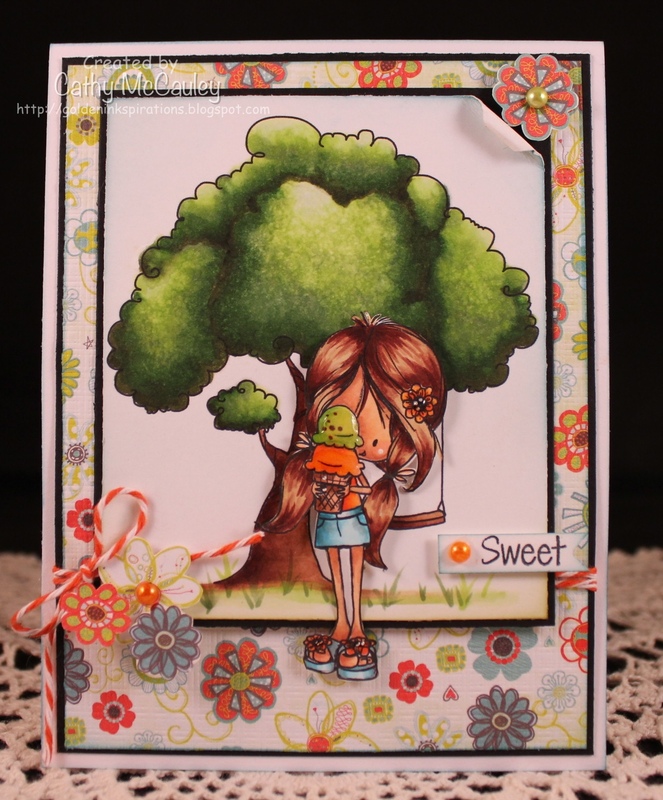 How did you like the July release by Sweet 'n Sassy Stamps? If you haven't had a chance to see the new stamp sets yet, head on over to the store and take a look. You will not be disappointed! You can count on seeing many samples using these sets in the upcoming weeks right here on my Sweet Stop blog post. In fact, I've used one of the new sets for my Sweet Stop sample today. I enjoyed working with SSS167 this week and I know you will, too! Lets get started! Creative Nugget: The sentiment is from the new "Words of Jesus" clear stamp set. The scripture verse was stamped on a circle nestie and mounted on True Black. The patterned paper panels are from the Country Garden Collection by Bo Bunny and each was also mounted on True Black. The panels were stitched to a Pure Luxury card front. The Bird Builder punch by SU! was used as an accent, keeping the sentiment the main focus of the card. Baker's Twine and pearls finish the card. Nice 'n Easy! The focus of the Christmas version is another one of Sweet 'n Sassy Stamps' birds...this one is the Cardinal Digi! 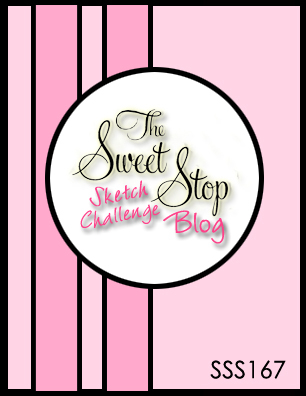 I hope I've inspired you to play along at The Sweet Stop! Here's SSS167 and the links to the other Sugar Babies' Blogs. Check out their fabulous samples for more inspiration! SNSS July Release Blog Hop! Welcome to another fabulous Sweet 'n Sassy Stamps New Release Blog Hop! As you hop along, you will see samples by the very talented Design Team Divas of all of the new stamp sets being released this month...that's seven beautiful stamp sets and one die set...AND they are all available right now in the store! You read correctly...keep a wish list of your favorites as you hop through the participating blogs, then head on over to the store where you will find all of the sets available for purchase as well as the whole release bundle! You will receive a free set when you purchase $50. Pssssst...you'll even find a free set up for grabs at one of the blogs you visit along the way! 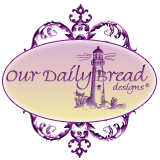 Be sure you comment on each blog to be eligible to win a prize. One lucky hopper will be randomly selected from a random blog to win the whole July Release! THERE's MORE!!! 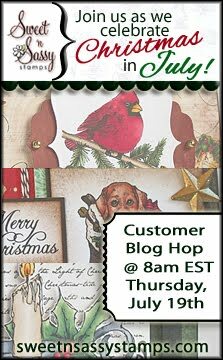 Please join us for our first ever Virtual Stamp Day Celebration over at Splitcoaststampers! Beginning at 10:00 EST, the Design Divas will be available throughout the day on the SNSS Release Party Forum to share challenges with you. You'll have until Friday, July 13th at 3:00 PM EST to play along in any of the challenges. Each separate project will get you one chance to win the clear stamp set of your choice from the release. If you can upload your project to your SCS gallery by 10:00 PM EST on the day of the celebration (Monday, July 9th), you'll get an extra chance to win a clear stamp set from the release! AND...if you use a Sweet 'n Sassy Stamps clear stamp or digi stamp, you'll get another chance to win! That's three chances to win a clear stamp set of your choice from the release! So grab a refreshing beverage and some munchies and let's get hoppin'! 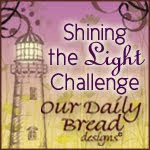 If you came by way of Kim Singdahlsen's Joyful Creations with Kim blog, you are right on track. 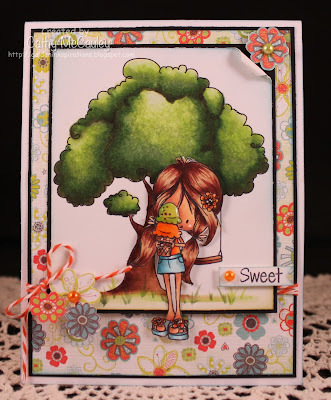 If not head on over to the Sweet 'n Sassy Stamps Blog to start at the beginning. Here is a list of today's bloggers in case you get lost along the way. 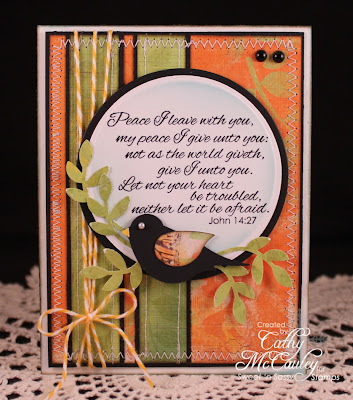 Cathy McCauley <--- You are here! 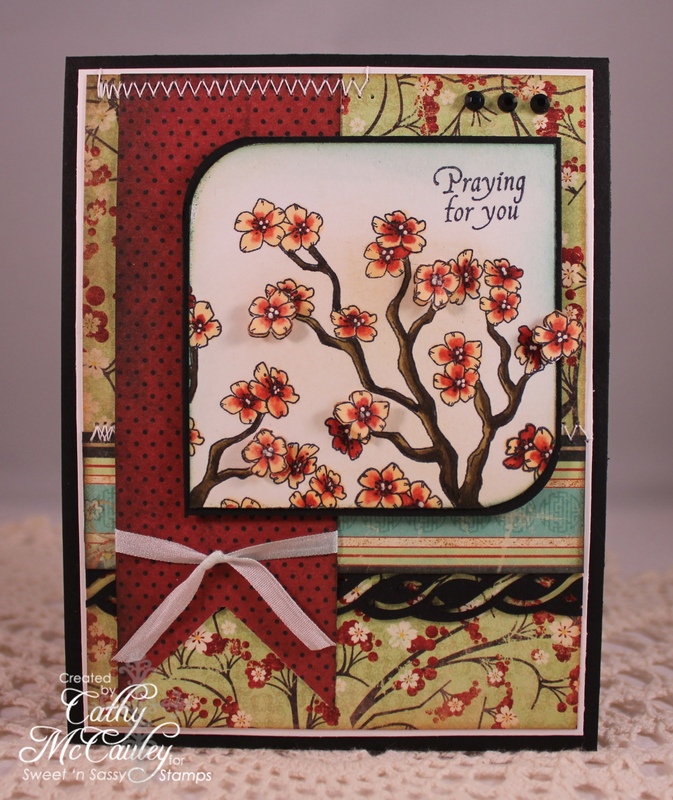 My first sample is from the beautiful new set, "Sheltering Cherry Blossom." It contains one cherry blossom branch and seven sentiments perfect for sending words of comfort to a hurting friend. Creative Nugget: This first card is actually a CASE of a card done by Loll Thompson from when she was the Featured Stamper on Splitcoaststampers. I loved the CAS design. The sentiment was stamped on the front first. Then the card base was sent through the Big Shot with the Canvas Impression Plate by PTI. The strip of patterned paper from the Serenity Collection paper pad by Bo Bunny was added next. Finally the Sheltering Cherry Blossom was stamped three times and different parts of the branch were cut with a square nestie. The images were colored with copics and sponged, then popped up on the DP strip with Dimensionals...nice and easy! Here's a second card from the same set. 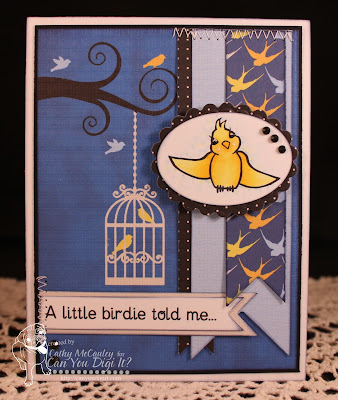 Creative Nugget: The patterned paper used on this card is also from the Serenity Collections paper pad by Bo Bunny. The patterns and colors are just perfect for the "Sheltering Cherry Blossom" clear stamp set. Some of the layers were matted with True Black card stock. A Fiskars border punch was used under the horizontal panel. The layers were mounted on Select White card stock and then to a True Black card base. Stitching was added across the banner and on the horizontal strip. The cherry blossom branch was stamped repeatedly on a square piece of Neenah Solar White card stock and the two opposite corners were rounded. Copics were used to color the image, and the panel was sponged a little before popping it up on the card. Some extra blossoms were cut out and popped up as well for some dimension. The centers of each blossom were dotted with a White Signo Gel Pen. My final sample is from "The Sea," a gorgeous set with one image and five wonderful verses. Creative Nugget: To begin this card, the bottom of a rectangle piece of Pure Luxury card stock was masked. 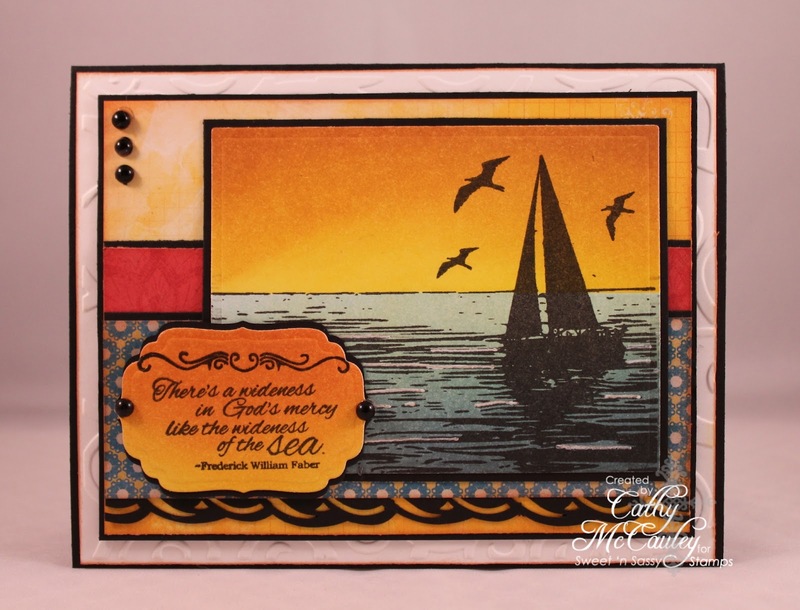 Mustard Seed, Wild Honey, Spiced Marmalade, and Fired Brick Distress Inks were sponged on the top to create the sunrise. The top was then masked while Salty Ocean, Faded Jeans, Chipped Sapphire, and Shabby Shutters Distress inks were sponged on the bottom for the ocean. The image was then stamped using Versafine Black Onyx Ink. A White Signo Gel Pen was used to create the foam on the top of some of the waves. This was then cut with a rectangle nestie. Some scraps of patterned paper, a Fiskars border, and True Black card stock were mounted on a piece of Pure Luxury card stock embossed with a CB folder. This was then mounted to a True Black card base. 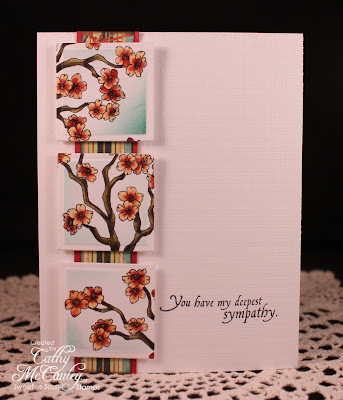 The sentiment and one of the new decorative elements from the new "Decorative Frame Toppers" clear stamp set were stamped on some sponged card stock and cut with a Spellbinders Label Die. Some black pearls finish the card. Now head on over to see some more fabulous eye candy by Jessica Flick! How's that wish list coming along? 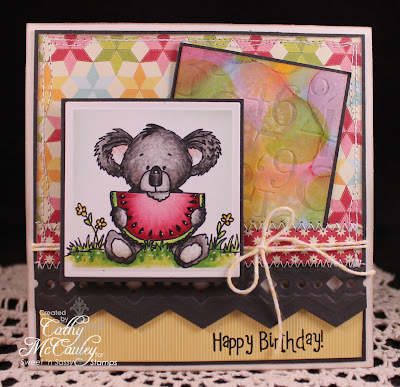 Hope to see you over at SCS later today for some more stamping fun! Have a fun-filled and blessed day! Thanks so much for stopping by! Hello stamping friends! I hope you all had a great Independence Day and were able to celebrate our nation's birthday with friends and family on the 4th. We were able to take the residents of a local nursing home to the town's 4th of July Parade. We kind of made a parade of our own as we wheeled the wheelchairs down the street dressed in red, white, and blue tie-dyed tee shirts. It was good to get these lovely ladies and one gentleman out for an evening of enjoyment! 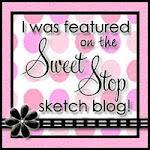 With the festivities of the 4th over, it's time to celebrate another great sketch at The Sweet Stop! How could I not make a card with red, white, and blue? Creative Nugget: This Lighthouse Digital Stamp at the Sweet 'n Sassy Stamps Store is a lot of fun to color...of course I used my copics for this. The panel was cut with a rectangle nestie and some light sponging with distress inks was done while still in the die. Glossy Accents and a rhinestone was added to the top of the lighthouse and the whole panel was mounted on a piece of Night of Navy card stock. A doily was cut from patterned paper using a Cheery Lynn die. Four panels of matching patterned paper were also mounted onto Night of Navy card stock. All of the layers were adhered to a Bashful Blue card base. A little piece of cheesecloth was tucked between the doily and the popped up lighthouse image. The banner was hand cut and rhinestones were added to the side of the sentiment. # 30 - Summer Holiday. Here's the Christmas version...the orientation was changed and the rectangle panel was replaced with a Christmas tree! 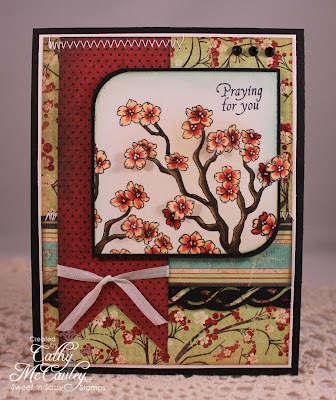 Our Daily Bread Design's "Joy Tree" was used for this sample and this card will also be submitted for the "Anything Goes" challenge on the ODBD Blog. This was such a fun sketch to work with...I do love my layers! 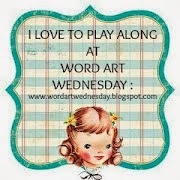 I hope you'll be able to find some stamping time this week and play along with us at The Sweet Stop. Take a moment to enjoy more wonderful samples by the other Sugar Babies and leave a little love behind! Thanks for stopping by! 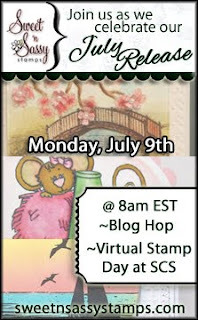 Be sure to stop back again on Monday for the Sweet 'n Sassy Stamps New Release Blog Hop. 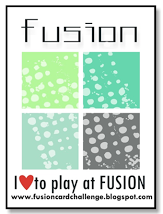 There will be lots of eye candy, challenges, and of course...PRIZES!